Treat yourself to an exclusive, once-in-a-lifetime Bora Bora vacation. Stay in an overwater bungalow and be pampered with heavenly Tahitian spa treatments. The islands of French Polynesia are a gorgeous collection of volcanic islands and atolls strewn lazily across the grand Pacific Ocean. Our honeymoon couple from Miami selected this Bora Bora Honeymoon: Overwater Bungalow and Spa Vacation to relax away their days and nights on Bora Bora, one of the world’s most exotic and luxurious islands. They loved discovering the sparkling magic of the island’s lagoon, admiring the awe-inspiring Mount Otemanu, and pampering themselves with one of kind spa treatments. They decided to stay in an overwater bungalow at the Intercontinental Bora Bora & Thalasso Spa, as it is a small property with just 80 bungalows. On this heavenly Bora Bora Honeymoon: Overwater Bungalow and Spa Vacation, they were able to wake up in the morning, open the shades, and soak up gorgeous views of the famous Mt. Otemanu right from their bed. During their amazing overwater bungalow vacation, they were utterly pampered with relaxing spa treatments that blend modern techniques with traditional Polynesian technique and deep sea ingredients. The day after they arrived, they washed away their jet lag with a heavenly, 2.5-hour couple’s massage in the comfort of their overwater bungalow. They also enjoyed a fabulous Polynesian Taurumi massage—a uniquely Tahitian massage treatment using local Hei Poa monoï oil—and a relaxing Pearl Rain massage to melt away all their stress. Of course, they also enjoyed some adventures on their Bora Bora Honeymoon: Overwater Bungalow and Spa Vacation. They went on a full-day lagoon adventure, where they were able to swim with reef sharks and giant manta rays. It was certainly a highlight of their trip! They also decided to take a fun ATV tour through the lush tropical rainforest. After a week in paradise, their Bora Bora Honeymoon: Overwater Bungalow and Spa Vacation came to an end. They returned home feeling rejuvenated and completely refreshed. Welcome to the Islands of Tahiti! Arrive in Papeete in the early morning, after your overnight flight from Los Angeles. A traditional Polynesian greeting will be followed by a short flight to Bora Bora. 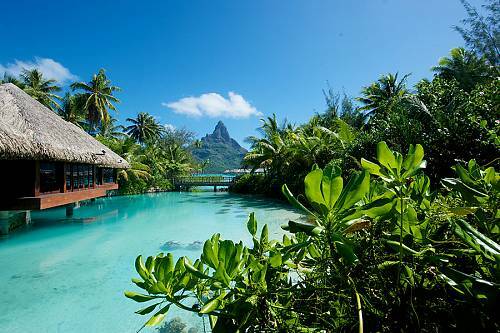 Upon arrival, you will be transferred to the InterContinental Bora Bora Resort & Thalasso Spa. 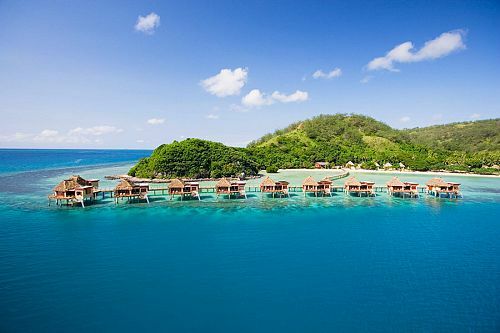 Your home for the next 7 nights is an ultra stylish overwater bungalow. With a shaded area and a sundeck with direct sunlight and lagoon access, your overwater bungalow is perfect for dining, napping, sunbathing, relaxing with sundowner cocktails, and refreshing in the outdoor shower at any time of day. Wake up to the sound of gentle waves this morning. Enjoy a delicious breakfast and perhaps take a morning dip in the lagoon. Today, you’ll be completely pampered with a 2.5-hour couple’s massage in your overwater bungalow. Drawing on modern wellness techniques as well as ancient Polynesian healing rituals, this heavenly treatment promises to relax and rejuvenate your mind, body, and spirit. It’s time for some adventure today! Enjoy an exciting, full-day lagoon safari where you’ll have the chance to swim with reef sharks and giant (but harmless) manta rays. Don’t forget your camera! 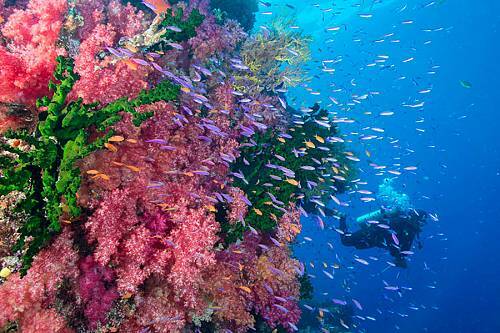 You’ll also have the chance to visit Bora Bora’s most photographed motu (small reef islet), Motu Tapu. Your adventure is complete with a delicious BBQ lunch. Return the resort for to another incredible spa experience. The Polynesian Taurumi massage works from head to toe and includes a sensual, relaxing full-body massage inspired by old Tahitian massage techniques. Using Hei Poa monoï and incorporating tropical scents, this massage is a must if you want to experience a truly local wellness treatment. Today, you’ll receive a gentle and relaxing Pearl Rain Massage. This gentle massage features natural oils and a deep-sea water shower, combining the benefits of a massage with the relaxing effects of a fine mist of warm water, freeing the body from all tensions. The next 2 days are yours to spend at your leisure. In addition to the gorgeous lagoon and white sand beaches, the resort offers several activities to enjoy. Kayaks and stand-up paddle boards are available free of charge, or you can opt to take a rainforest tour, ATV ride, or an excursion into town. Back at the resort, see traditional Polynesian crafts like weaving and jewelry making. 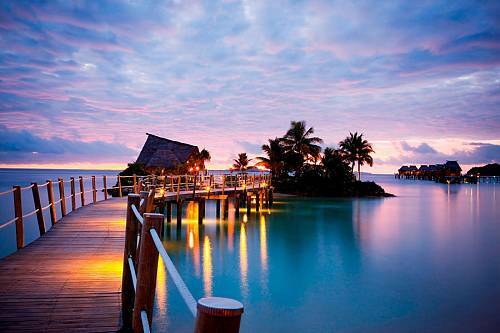 Today, your incredible Bora Bora vacation comes to an end. Enjoy a shared transfer to the airport for your connecting flight to Papeete. Depart Papeete and arrive in Los Angeles the next day. 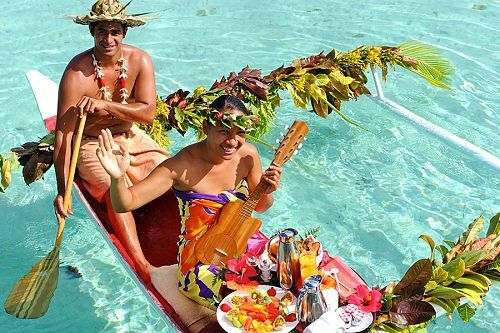 Top off your relaxing stay with a special dinner at Villa Mahana on Bora Bora. This intimate, 6-table restaurant is known for its romantic ambiance and excellent French cuisine. Chef Damian will take good care of you!